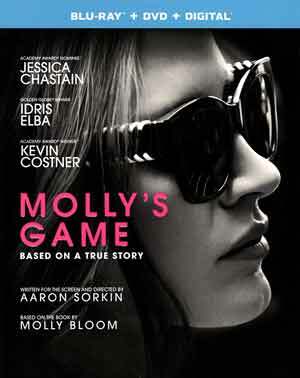 The film is based on true events about Molly Bloom (JESSICA CHASTAIN) as she went from Olympic-class skiing, when she was injured after a freak accident, taking time off before entering college and ultimately working for a man who ran a high-stakes poker table for the rich and powerful in Hollywood, for which she would manage and be handsomely rewarded with tips. Soon enough, especially when her a-hole boss wants her to work for him 24/7 for free or else she would lose her extra income from the poker games, Molly sets up her own game and takes the players with her, including a man known only in the movie as Player X (MICHAEL CERA), though it’s been easily determined he is in fact Tobey Maguire; no surprise why he’s not named, since it does make him look like an absolutely sociopath. In any case, she quickly gains success and it’s all legal but like her former boss, Player X wants his stake given the people he’s roped in players. Eventually she’s locked out. After taking some time off, Molly quickly bounces back, this time in New York City, with a better game plan bringing in brilliant, and beautiful, women who help spread interest for another high-stakes poker room, this time with a $250k buy-in (the others were only $10k and $50k if I remember correctly). This doesn’t draw in the celebrities from the West coast but does bring in high-rollers and business is good. And still legal… until she realizes, thanks to one of the ladies, that as the bets got bigger, her exposure became riskier, and she would take a rake (a percentage of the pot in hands), which is very much illegal. When one of her players is caught in a Ponzi scheme, he turns into an FBI informant giving up Molly’s name which then had the Feds tapping other clients’ phones leading to her unintentional involvement with the Russian mob. 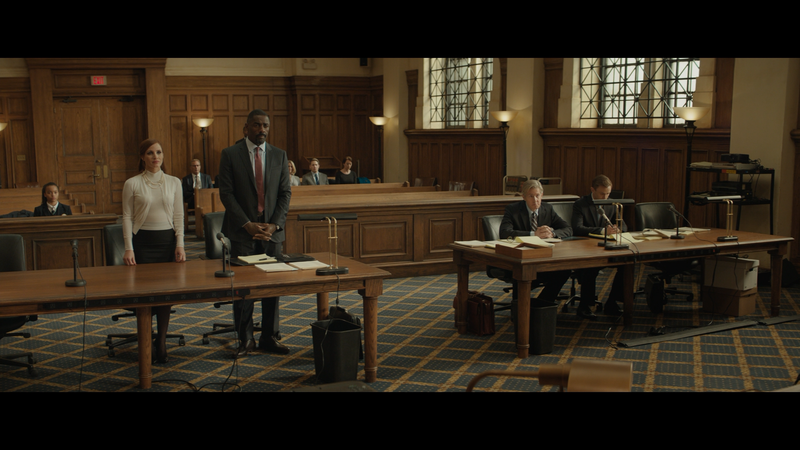 Molly’s Game goes back and forth in time from hiring high-powered and ethical attorney Charlie Jaffey (IDRIS ELBA), to how she got caught and even further back with her complicated history with her psychiatrist father (KEVIN COSTNER) who pushed her hard, which only led to her being a rebellious teenager on steroids. As I said on the onset, the film, based on Molly Bloom’s own book, was written for the screen by Aaron Sorkin, probably better known as the creator of The West Wing and the ever annoying Newsroom. 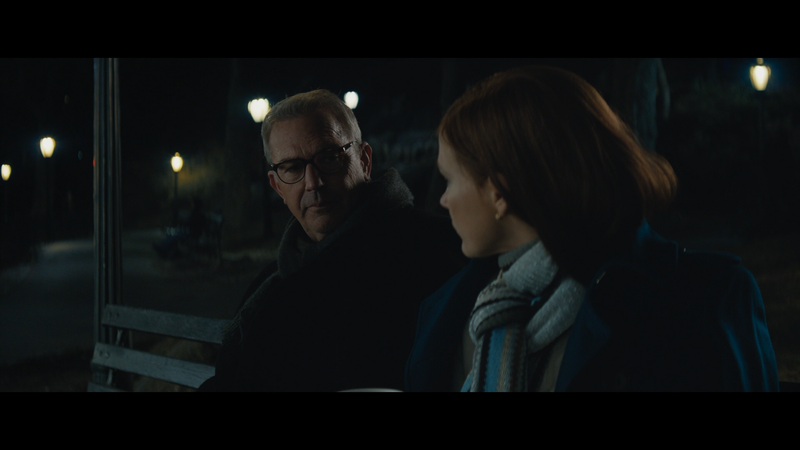 No surprise that there is not only a ton of dialogue, but you can add in narration by Jessica Chastain’s Molly for extra measure; let’s just say if Sorkin were being paid by the word, he would be a billionaire… The ad nauseam amount of dialogue did become at times tiring. But where Molly’s Game does work is with the performances by Jessica Chastain and Idris Elba who both are absolutely charming and charismatic in their scenes, Elba especially to the point I would watch a spin-off film about his character. Chastain for her part shows some good range of a damaged girl with some typical daddy issues and her quick ascension and decline that landed her in the crosshairs of the FBI. 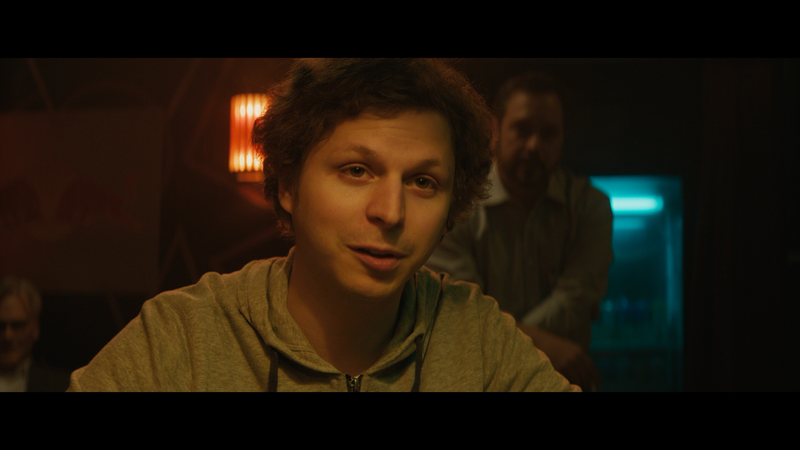 Kevin Costner is in a few okay scenes and Michael Cera was douchy enough to be despicable, though I imagine the Maguire might be a worse individual than even what the movie showed. In the end, even if there was far too much dialogue and not nearly enough quiet, reflective scenes, the story itself was absolutely compelling and at times was right up there with other poker movies like Rounders and the underrated 21. I can’t quite highly recommend Molly’s Game outside of a rental since it does run too long, but for the performances and a genuinely interesting based on a true story plot, it’s worth checking out. This release comes with a title-embossed slip cover; inside is a redemption code for the Digital HD copy. Building an Empire (3:03; HD) is basically a promotional featurette with on-set interviews with writer/director Aaron Sorkin, actress Jessica Chastain, the real Molly Bloom and others. This really offers no insight into the story, characters or anything else. Universal plays Molly’s Game on Blu-ray. The film is presented with a 2.40 widescreen aspect ratio and given an MPEG-4 AVC codec and 1080p high-definition transfer which, for the most part, looks very good. Detail is relatively sharp especially with close-ups and skin tones do appear natural. Black levels are fine with some looking stark but not losing any of the persons or objects within. Although nothing amazing as it’s more or less what you would expect from a drama. The movie comes with a unnecessarily strong, considering the movie is 99.9% dialogue and all, DTS-HD Master Audio 7.1 track. Of course, the dialogue does come across with great clarity and there is some rather decent depth in a few moments from the smaller things like the sounds of chips on the table or a brutal attack scene. Probably the 5.1 option would’ve been fine since I didn’t feel the additional two channels offered much more. Overall, Molly’s Game, in spite of the seemingly non-stop dialogue (both in-movie and with narration) and excessive running time, was still rather entertaining especially for those who enjoy the “sport” of poker or can appreciate the performance, and let’s face it appearance, of Jessica Chastain who does command the screen. As it is, it’s worth a rental. The Blu-ray release has good video/audio transfers but an utterly lackluster featurette.